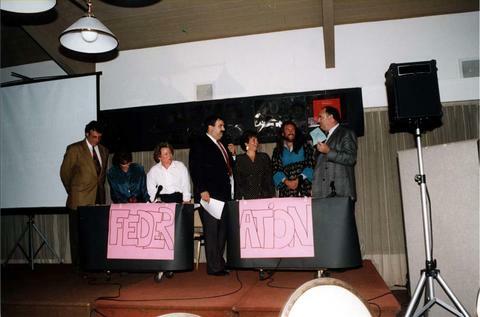 Photograph depicts a group of people on stage. The caption from the JWB reads: Mishpocha Mishigas, with emcee "Benny Fishery" (Ed Gavsie). Separate paper provides short description. Reads: "'JUISH T.V.' Jewish Federation of Greater Vancouver Richmond Country Club. Sept. 12/91 For Sept. 26/91 see layout."